A pleasant half-day’s cycling covering approximately 21 miles, and taking in the eight historic Hop Churches to the north and west of the picturesque market town of Ledbury. It has the highest churches-per-mile of any route we know, and much of it is on quiet rural lanes, though there are a few sections on A and B roads. It passes through rolling countryside with no major hills, and is eminently suitable for non-lycra cyclists. The route as described starts and ends in Bosbury at Holy Trinity Church in the middle of the village, where there is ample free parking. 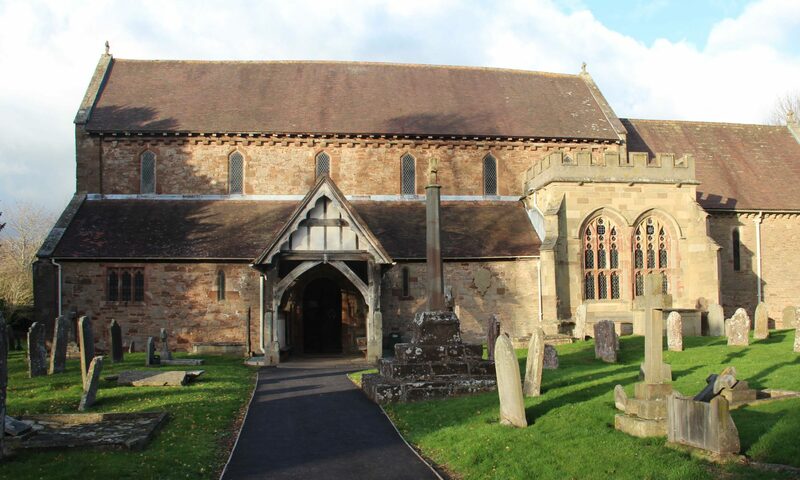 Alternatively, you could start in the centre of Ledbury and also visit the splendid church of St Michael and All Angels – this adds approximately 5 miles to the distance, much of it on the B4214. There are pubs in Bosbury, Tarrington, at the Trumpet, and in Staplow, as well as a wide range of refreshment options in Ledbury. From Bosbury take the B4220 towards Ledbury, this turns sharp left at the turnoff towards Bromyard and turns into the B4214. Take the next lane on the right towards Ashperton and keep on, ignoring all side roads. After a sharp right turn over a diminutive bridge by a farm you will see an overgrown cutting to your right as the road climbs steadily – this is the line of the Herefordshire and Gloucestershire canal which closed in 1881. When you see Tunnel Cottage on your right, you can peer over and almost see where the tunnel entrance used to be. A band of optimistic enthusiasts hopes to re-open the canal, and a short section is already open at the Gloucester end: however, the restoration of this tunnel as well as another one the other side of Ledbury presents a formidable financial obstacle. Eventually you will reach Ashperton and the A417 – turn right, and then almost immediately left down Church Lane to St Bartholomew. From Ashperton church rejoin the A417 turning left. After a little less than a mile take the first lane on the right towards Canon Frome, then the first left between gateposts up the drive to Canon Frome Court. This imposing old house is now home to a farm community – the estate church of St James is to the right. Stretton Grandison and the church of St Lawrence is just 1.5 miles from here – return to the A417, turn right, and then take the first lane on the right as the road bears left. From St Lawrence we now head along the bottom of the Frome valley to Yarkhill – return to the A417, turning left and then soon right into Watery Lane. This leads us directly to the church of St John the Baptist on to the right. From Yarkhill church we carry straight on to a T junction, turning left over the railway and soon reaching the A438. Cross the main road with care and go straight on up the lane: you will soon see the oddly truncated spire of St Mary to your left. Carry on up the lane beyond the church, taking the first left turning towards Tarrington. Take School Lane past the community hall and the church of St Mary and St James will appear on the right. From here we head back towards Ledbury on the A438, but we do not have too far to go on the main road, heading straight across the Trumpet crossroads with its black and white pub and taking the first lane on the left towards Munsley. After a very pleasant scenic section, the tiny church of St Bartholomew will come into sight on the left. From here we take the right fork at the next junction and soon come back to the B4214 where we can either turn left back to Bosbury, or right to return to Ledbury.